Chip Somodevilla/Getty ImagesScottish actor Gerard Butler poses for photos with members of the US military after a news conference about his new action film ‘Hunter Killer’ at the Pentagon in Arlington, Virginia, October 15, 2018. 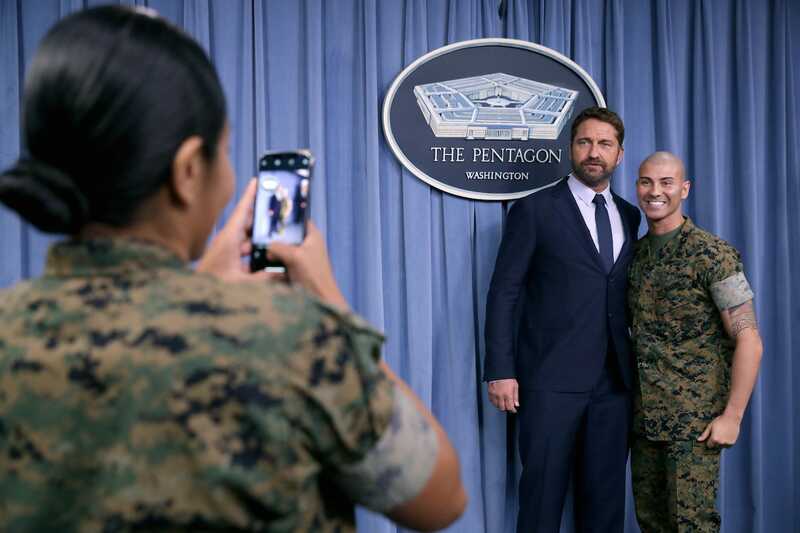 During visit to the Pentagon on Monday to promote an upcoming movie, Gerard Butler told reporters he canceled a trip to Saudi Arabia after the disappearance of Saudi journalist Jamal Khashoggi, who entered the Saudi Consulate in Istanbul on October 2 to get documents needed for his wedding and hasn’t been seen since. “When I woke up in the morning before we were supposed to go to Saudi Arabia, we were informed of what was happening, and it just didn’t feel like a good time to be getting involved with that,” Butler told reporters. Turkish officials have alleged that Khashoggi was killed and dismembered in the consulate in Istanbul. The Saudi government and Crown Prince Mohammed bin Salman, the country’s de facto leader, have denied involvement. 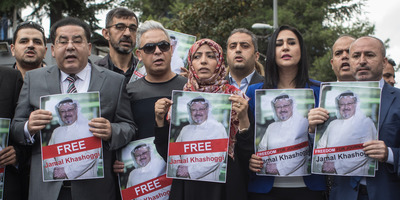 On Monday, however, The New York Times reported that Saudi Arabia was preparing an alternate explanation and may soon claim that Khashoggi died inadvertently during interrogation. President Donald Trump has also distanced the Saudi government from the incident, touting on Monday the “very strong” denial made by King Salman, the crown prince’s father, and suggesting “rogue killers” were responsible. Butler said on Monday that he was planning to meet with the crown prince during his visit, and, like Butler, a number of other business leaders and officials have also pulled out of trips to the country in the wake of Khashoggi’s disappearance. The CEOs of HSBC, Credit Suisse, and Standard Chartered have said they won’t be attending the Future Investment Initiative, an investment conference known as “Davos in the Desert” that the Saudi government has used to attract investors. The CEOs of Uber and Viacom dropped out last week, followed by counterparts from JPMorgan Chase, BlackRock, Mastercard, and Ford on Monday. Business leaders and actors have different relationships with foreign countries than do national governments, but the Trump administration has not distanced itself from or criticised Riyadh, even as congressional leaders promise action if the Saudi government is responsible for the disappearance. Treasury Secretary Steven Mnuchin said last week that while the administration was “concerned about the status” of Khashoggi, he would still attend the conference. Trump said the US “would be punishing ourselves” by cancelling those deals because Riyadh could partner with Russia or China, even though such a switch would take years to carry out. The US president also repeated Mohammed bin Salman’s denial on Monday.